What do Andrew Carnegie & William Wrigley, Jr. have in common? They were both in a business round table. The modern day round table is synonymous with the first mastermind group, called the Big 6, which Andrew Carnegie, William Wrigley, Jr. and four other Chicago business executives began in the 1920’s. The combined income of these six executives was estimated at $25 million dollars in 1920. In 2015 dollars, that would be about $310 million dollars per year! Forbes magazine says “Masterminds are incredible and can do wonders for your business as well as for you”. 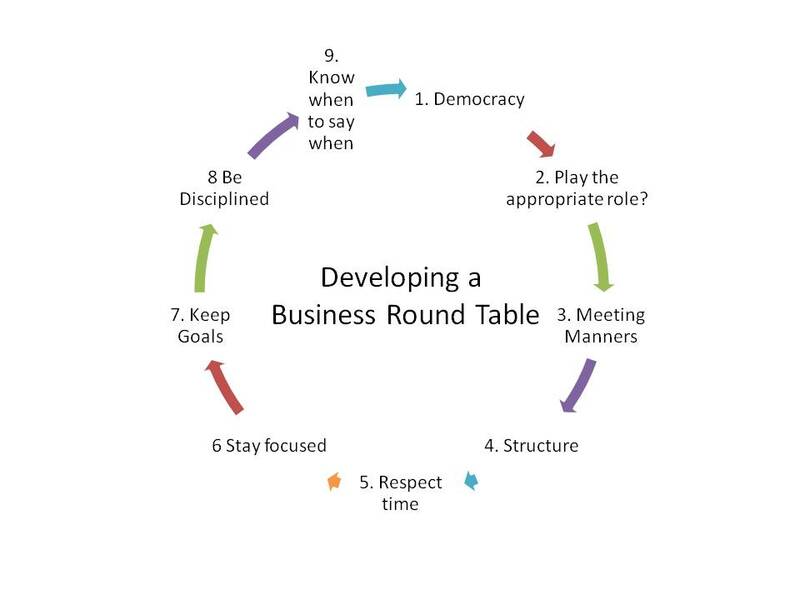 An important key to the success of a business round table is establishing an ongoing format and starting the first meeting with details of what is to come. Well run business round tables have a very successful history. Bring a resource to share. Share an idea that is currently working for you and your company. The question of where you need help is up to the member. Business issues at times intertwine with personal issues so members should be free to choose the topic for their time to speak. It’s important to remember that this is not a time to solicit other members. An acceptable exception is if the member wants to go over a sales presentation and get members’ feedback. Examples of topics to bring up to the round table are new product ideas, marketing campaigns, technical issues, legal questions, accounting questions, web design or any other issue that will help the members be more successful in running their business. Sharing a resource could be as simple as sharing with the group a new Smartphone app that helps them in their business. Sharing an idea that is currently working could be anything that your company is doing that is particularly successful. The time each member has will be determined prior to the meeting and depend on the number of members in the meeting. The time to speak could be anywhere in-between 8 and 20 minutes. Each participant should conclude their time to talk with a short summary on what they are hoping to accomplish by the next meeting and be prepared to let the group know how those plans went at the next meeting. Expect email communication in between meetings. The members should arrange to acquire a summary of the topics discussed and the goals for the next meeting for each member. They should also expect to be contacted prior to the next meeting to check in. Establishing ground rules from the outset is important to the continued success of the group. Meetings must start on time, have specific time limits for each member to speak and end on time. One member should be responsible for keeping time. Where, when and how long each meeting is should be a consensus of the group. Keeping the format and rules simple will help the meetings to run smoothly. The most important rules of the group are no negativity and all information discussed within the group is confidential. The group is a democracy. Know your role and don’t dominate the group. Know when the group’s usefulness has been fulfilled. Vitale, Joe, and Bill Hibbler. “Getting Started.” Meet & Grow Rich. Hoboken: John Wiley& Sons, 2006. 39. Print. How people save for retirement is outdated and needs to change. Times have changed and retirement advice needs to be more flexible. Traditional retirement advice has been designed to take care of that average turn of the century person. “Life expectancy at the turn of the 20th century was approximately 49 years at birth and about 12 years for those age 60.” I have been giving retirement plan advice for over 25 years and most of it has been based on the strategies that were created by mega mutual fund companies. The traditional concept of retirement planning has been to invest a little every year until you have enough money to replace your income. I’ve met with lots of employees over the years and I am generous when I estimate that the strategy works for less than a quarter of the employees. The problem is not picking the wrong investment, or paying too many high fees or investing at the wrong time. All of those things are important, but the biggest problem is life happens and people do not save enough money. Do you remember when you got your first paycheck? What did you do with it? You probably bought stuff and if you didn’t have enough money to get the stuff you wanted, you got a credit card or set up a repayment plan so you could get the stuff you wanted. People set the level of their buying habits based on their income. I contend that if the average person starts off spending less and saving more it will not change their life dramatically. Rather than buying that new car when you get your first job, consider driving what you have and saving about a third of your paycheck. When I set up a new retirement plan, the employer will match three to six percent of what the employee contributes. Employees generally only contribute only what their employer will match. They see the maximum 401k contribution of $18,000 and think that is only for people making a quarter million dollars a year. Employees need to change their frame of mind. Imagine that $18,000 limit is for the average person. The median household income in 2013 was $51,752. That $18,000 is 35% of income. It’s not impossible to save that much. Let’s be modest and estimate your employer matches 3%. Add the employee’s contribution and that equals $19,552 per year. Even with no interest, that accumulates to a quarter million dollars within less than 13 years. Savings of that level gives financial freedom. If you are that new college graduate starting a job and think, you can’t save $18,000 a year, then stay with the status quo. Save the standard 3% or about $1,500 a year and wait until you get to your 60’s before you even get close to that quarter million dollar mark of personal savings. In 2011, the average 60-some-year-old had $135,008 in their 401k account. No matter what your age is, change your perspective. Thirteen years is not that long. Save as much as you can and give yourself financial freedom. Wiatrowski, William. “Changing Retirement Age: Ups and Downs.” Bureau of Labor Statistics. Department of Labor, 3 Apr. 2001. Web. 3 Apr. 2015. Posey, Kirby. “United States Census Bureau.” State Median Income. U.S. Department of Commerce, 1 Jan. 2013. Web. 3 Apr. 2015. “What “Average” 401(k) Balances Can Miss.” Fast Facts. Employee Benefit Research Institute, 31 Oct. 2013. Web. 3 Apr. 2015.